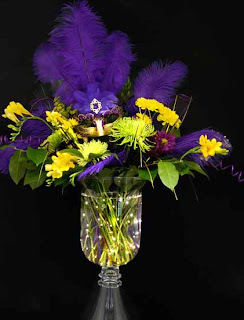 Popular feather trees are a great festive, glitzy centerpiece option for a Mardi Gras party. Add in some glittered harlequin masks and Mardi Gras beads and your Mardi Gras themed centerpiece is complete. Here is a tutorial to show you how surprisingly easy and quick these feather tree centerpieces are to make. Ostrich Feathers: Purple (2 packs), Green (2 packs) and Yellow (1 pack). These come in packs of 6 feathers that range from 14 to 16 inches long. Put together the clear plastic centerpiece form using a 10-inch plate at the bottom, the 18-inch column, and the 6-inch plate at the top. These pieces (each sold separately) fit together easily with out any glue or adhesive. The centerpiece form is 20-inches tall. The completed centerpiece with feathers will be about 35-inches tall and 26-inches wide. If you need a different height, all of the clear plastic pieces are interchangeable. For instance, to make this same centerpiece shorter, use the 10-inch tall column. You can also make the centerpiece very tall by adding the 10-inch or 18-inch column to what you see above, and adding a second 6-inch plate at the top. To see the whole selection of plates, columns and bases, click here. First, place a piece of clear packing tape at the bottom opening of the centerpiece base, so the beads do not fall out if you need to move the centerpiece. Cut one of each color Mardi Gras bead so that it is one long strand. Hold all three strands together and drop into the column. Use another 1/2 strand to fill up the column to the top. Using scissors or a utility knife, cut out a piece of dry floral foam into a 1 in. x 1 in. 4 in. block. Insert into the top of the centerpiece column so that about half sticks out. The block shouldn't wiggle around, but be stuck in at the top. Use hot glue to glue in place if necessary. You can also use a bouquet holder. Start at the bottom, and insert the ends of ostrich feathers into the floral foam. Alternate the colors and go all the way around, turning the centerpiece as you go. The feathers should be angled downward at about 45-degrees, as shown in the photo on the left. Next, insert the feathers a little higher than 90-degree angle. Again, alternate colors and go all the way around, filling in the empty space. Finally, insert feathers at the top. Now is the time to move feathers around to fill spaces, and to add extra feathers where needed. Turn your centerpiece all the way around to make sure it looks good from all angles. This Diamond Glitter Mardi Gras Mask comes with ribbon ties. Cut these off, and attach a thin wooden dowel or any sturdy, thin stick to the back side of the mask with hot glue. Insert the mask stick into the floral foam and column, near the center. This will be the focal point of the center piece. To add more length and drama to the centerpiece, hang 3 uncut strands of your purple, green and gold Mardi Gras beads from the top centerpiece plate. Secure with some hot glue. You can also scatter more beads, the same diamond mask and Mardi Gras coins around the base to add a festive feel to the tablescape. These accents can even act as easy party favors for guests to take home. Where do you get the clear centerpiece base? Thanks for stopping by. Good luck with your project. Love the look But where can I find a bulk of Ostrich feathers at a great price. B/c I have to make 50 centerpieces.